If you’re currently on a kale kick and are searching for a new salad recipe then you’ve come to the right place! Kale and coconut compliment each other perfectly and once you combine them into a salad with some other unique ingredients this combination turns into one of the best tasting quick meals you may ever have. 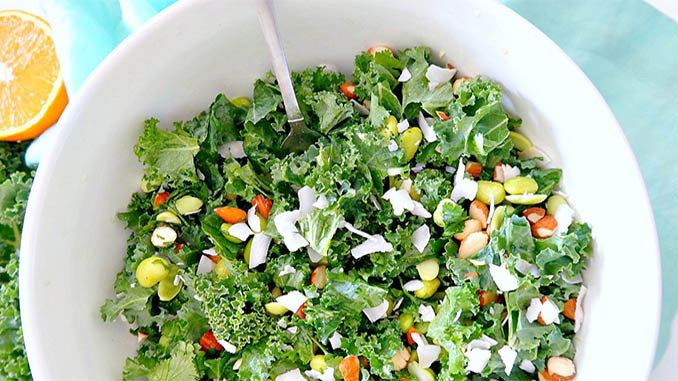 Kale is detoxifying by itself, but when you add in other ingredients such as cilantro, freshly squeezed lemon juice, apple cider vinegar and activated almonds, you now have a powerful body cleansing salad! 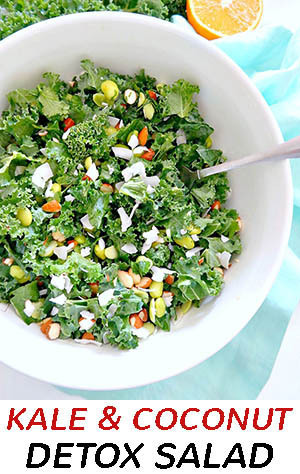 Read over the simple kale and coconut detox salad recipe below and see how you can put one together just like in the picture. This recipe makes a total of two servings! 1) Start by soaking the almonds (optional, but recommended!). 2) Combine all salad ingredients in a big bowl and mix until well combined. 3) In a bowl, mix together all ingredients for the dressing. Pour over salad and toss until combined. 4) Refrigerate for 2-3 hours or eat right away. This salad recipe is a great choice for the spring time. Winter months will usually dry your skin and the kale and coconut salad does a fantastic job with skin rejuvenation. Especially kale! One important side note, leftovers will normally stay good for up to 3 days.